Siccar Point, viewed from the top of the cliff. Image: Angus Miller. James Hutton, father of modern geology, visited Siccar Point by boat in 1788, an event which led to a profound change in the way the history of the Earth was understood. A man ahead of his time, James Hutton used the evidence from Siccar Point to decode Earth processes and to argue for a much greater length of geological time than was popularly accepted. 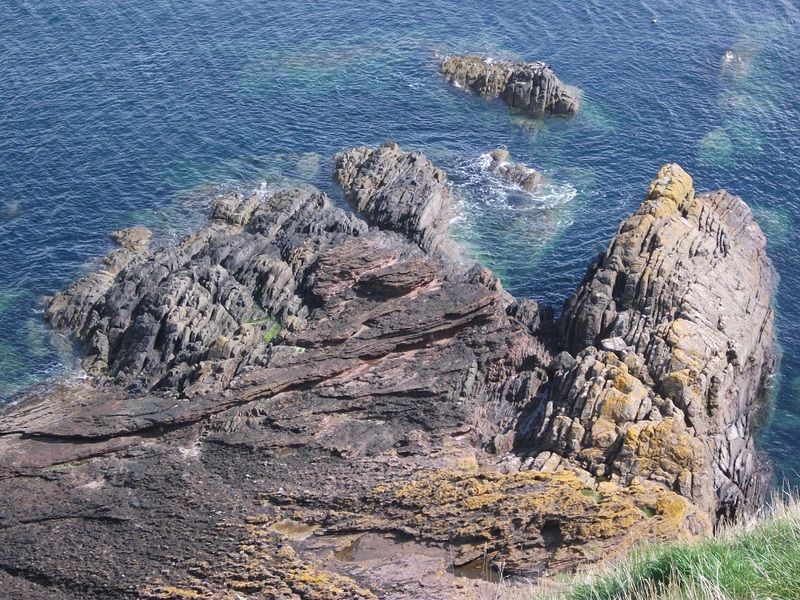 You can visit Siccar Point today, and see the spectacular junction between two distinctive types of rock separated in age by millions of years, just as Hutton himself found it. There are two sets of rocks at Siccar Point. The underlying layers are dark-grey, steeply- tilted rocks called greywacke that formed in an ancient ocean in the Silurian Period. These are overlain by younger, almost horizontal red sandstone layers that formed in desert conditions on land during the Devonian Period. The deposition of the two different types of rock was not continuous, but separated by a gap of 65 million years during which time the older rocks were changed and eroded – a phenomenon known by geologists as an ‘unconformity’. As John Playfair later recorded of their visit “The mind seemed to grow giddy by looking so far back into the abyss of time”. A concept of ‘deep time’ emerged with the recognition that the geological processes occurring around us today have operated over a long period and will continue to do so into the future. Indeed, as you view Siccar Point from the cliffs above, or by walking right over the tilted layers themselves right down by the sea, the ‘giddy’ sensation of looking far back into Earth’s geological history is profound. Walk in James Hutton’s footsteps and explore the story of this remarkable man and our modern understanding of his geology, representing millions of years of erosion, deposition, folding, faulting and uplift. 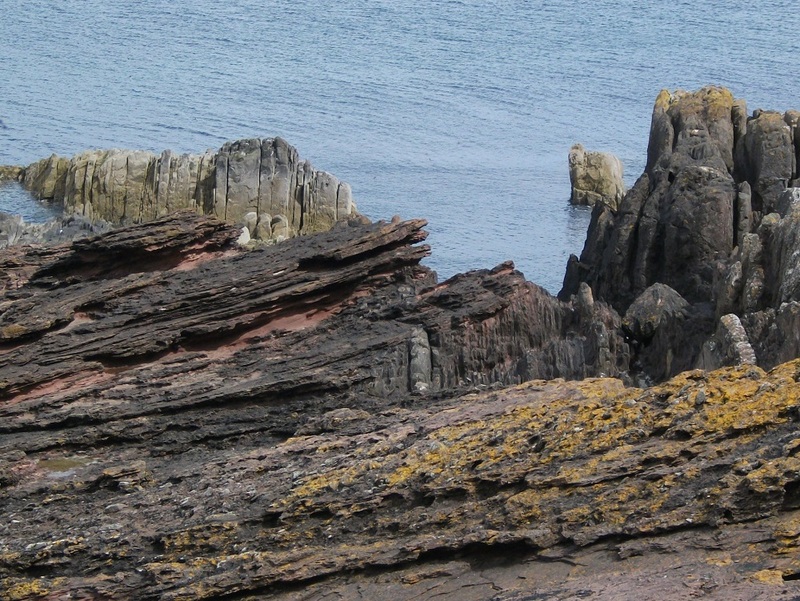 Close up of Hutton’s unconformity at Siccar Point. Image: Angus Miller.